In arctic-alpine areas, the growing season is short and intense, and even small changes in the length of the growing season highly influence the plant production, and the population dynamics of most animals, insects, and for instance the migration patterns of birds. Changes in the growing season are also important for the feedback loop to the climate and therefor for climate modeling. Arctic-alpine areas are characterized by scattered vegetation cover and huge differences in plant species composition and in the length of the growing season between ridges and snow-beds. This as a result of local topography, hydrology, and winter snow depth, which could lead to 3-6 weeks earlier onset of flowering on a ridge compared with a snow-bed a few meters away. The aim of this study is to map to the onset and end of the growing season (phenology) by using MODIS data for the 2000-2012 period. The study areas are alpine areas of mainland Norway and the Arctic Archipelago Svalbard. We also use Formosat-2 data to simulate Sentinel-2 data. 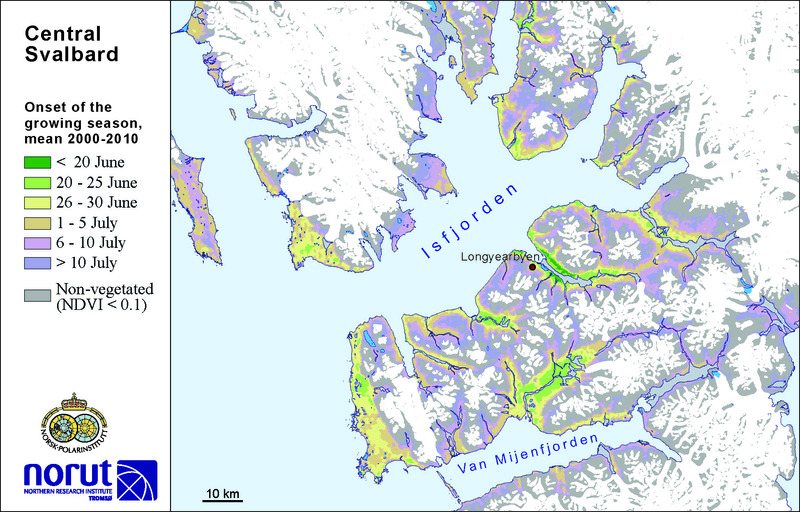 For validation of the satellite data we have established phenological field observations along tracks both close to Longyearbyen in Svalbard and at Dovrefjell in alpine mainland Norway. These tracks were designed to detect the phenological variation at a scale that can be compared with MODIS data, and is now being adjusted for the forthcoming Sentinel-2. To map the seasonal dynamic in vegetation by MODIS data, we use both the MOD09A1 product (8-days, 500m, 7-bands reflectance) and the MOD09Q1 product (8-days, 250m, red and NIR reflectance). The cloud mask used in the MODIS data (QA-values) have lot of errors in the high north, and in the first step we developed our own cloud detection procedures based on the 7-bands, as well as visual evaluation of the cloud cover of each 8-days period. In the second step we replace the cloudy pixels based on temporal information (the periods before and after or median values form years before/after). In the final step we smoothed the different indices and the 7-bands using the TIMESAT program. To map the seasonal dynamic we first analysed the spectral reflectance of the 7 MODIS bands of different land cover types during the snow free season, in order to identify which band combinations best detect different phenophases as onset and end of the growing season. The results indicates large variations in the onset of growing season from year-to-year during the 2000 to 2012 period both in alpine Norway and on Svalbard. In particular, in some fjords and on the northeast coast on Svalbard, the annual variation in onset of the growing season is large, possible related to the timing of the melting sea-ice. However, the results also indicate that MODIS (and accordingly Sentinel-3) data with a spatial resolution of 250/500m do not catch the local differences between ridges and snow-beds, and, hence, it is difficult to validate the MODIS-based growing season maps from field observations of the growing season. Formosat-2 data, with 8m spatial resolution, easily maps these local differences, and the onset of the growing season can be mapped with a NDVI pixel-specific threshold method. However, Formosat-2 data only have spectral bands in the visible and near-infrared parts, and the preliminary results indicate that these bands do not easily catch the timing of the end of the growing season. The MODIS based mapping indicates that the SWIR band could be used in combination with visible bands to map late autumn phenophases. In addition, the swath with of only 24 km of the Formosat-2 data is not practical to use for mapping large and remote areas as the arctic-alpine zone. The pair of Sentinel-2 satellites fills this gap and creates an opportunity to map the growing season in arctic-alpine areas. The Sentinel-2 sensor with high spatial resolution of 10-60m, wide-swath of 290 km, and frequent revisit time at northern latitudes is designed to detect variability in land surface conditions, and will provide perfect data for seasonal change detection, as it is expected to catch most of the local variation in the growing season in arctic-alpine areas. In particular, this is the case for mapping autumn events where the Sentinel-2 spectral bands in 'the red edge' and the SWIR parts would improve the mapping of the end of the growing season. Figure. Central part of Svalbard. Onset of the growing season, mean values for the 2000 to 2010 period.